Did you check for updated installers? If you're looking in the Shaping tab, do they show up in the Parameters tab? Ok, this is good news. They ARE showing in the parameters tab. ...so is there a way to get them to show in the shaping tab again? I apologize, but I'm not sure what you mean by "updated installers". I did use my original installers that I initially purchased to uninstall and reinstall the morphs. I now understand what you mean by updated installers. I went back to my order history and reset my downloads for the morphs and reinstalled the updated versions and that fixed the issue (had trouble finding them initially in my order history since they were purchased under the "Photoshop 3D Model Pro Suite"). Thank you so much for helping me resolve this issue. I know several items are mentioned in this thread, but by chance is there a comprehensive list of items that must/might need to be re-installed with the 4.5 upgrade? *Sigh*. Well a simple reinstall worked for both of the two products I tested that on that wouldn't load before. So I suspect that I'm going to be spending most of tomorrow reinstalling Genesis characters. I may just go ahead and reinstall all of them rather than plow through the list to see which load and which don't. Given that the two I reinstalled were only installed the first time at the beginning of the PA sale it's clearly the way 4.5 reads the installed information. Clearly wants it fresher than it is. There's a thread listing updated Genesis products. I don't know for sure whether non-Genesis content is having similar problems. Warning: it's a *long* list. ...OK so decided to install 4.5P just to see how it would react to my "ancient" system (did not install the Genesis Starter Essentials as the installer was over 400MB). Also loaded and applied the Darkside UI. And yes,, the new 3Delight is very fast compared to 3A. Managed to rework the scene in question so it finally rendered. Lighting used was a UE preset. Size 800 x 800. Had to substitute a default V4 Map on Leela for the Tindra one (nothing I did seemed to correct the facial and leg Map errors). The scene rendered in 1 min 22sec + about 25 sec for the shadow mapping. In 3a (with a basic "non UE" light set), It took nearly 8 minutes plus another 1:10 for shadow mapping. (while originally created in 3A the scene was saved in 4.0.3). OK now a couple things that didn't work. 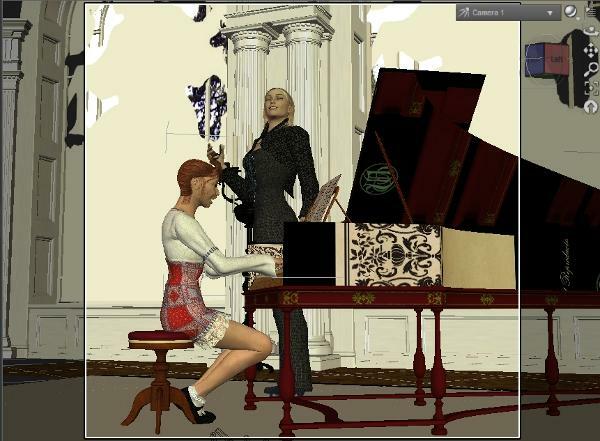 Tried to open a version of the same scene created in 3A (which wasn't saved in 4.0) and discovered the maps of the Baroque Grandeur set and Harpsichord were totally messed up (see attached SS below) . Reloading the textures in 4.5 did nothing so apparently apparently there is a conflict with the UV mapping between 3A and 4.5. Deleting an item and reloading a fresh version in 4.5 presented the same UV mapping error. All directory mapping was preserved in the update so not sure how this occurred. Saving a .daz scene in 4.5 apparently corrupts the original scene file as apparently the only format option for saving a scene is .duf. While reloading the saved 4.5 version (after closing the application down and reopening it to clear memory), there were multiple ""clearing scene" messages, and when the load was complete, parts of the set (like the window glass and some frame details) were missing. Not sure if this has to do with the fact that my content is all installed to my 3A runtime rather than the 4.5 Library, but supposedly 4.5 should be able to read from all runtimes mapped under Preferences/Content Management. Well - that will mean that I will tell everybody not to buy things from Dreamlight! When I reset my Mac Pro Suite to Download again, for installation in DS4.5Pro, there are the Genesis Evolution Head Morphs and the Genesis Evolution Body Morphs. Are these the ones that were uninstalled and then replaced by the Genesis Essentials? In other words, are there any downloads that a user of version 4.5 should NOT install in that version? What do the Genesis Essentials replace? I need a little help with install. I have a new machine in my office, it has win 7 64 bits, a SSD with free 60 Gb (Disk C with OS only for programs) and a HD with 500 Gb (Disk D for content). I want install DAZ Studio pro 4.5 in this machine, but content must go to disk D, if it is possible, I want also DS4.5 program files in D. Yesterday I was trying to install in this way, but nothing in content was installed. DS4.5 worked, but it hadn't genesis figure or content. Content folders aren't created in C nor D.
If I search rute for genesis.duf in edit/preference this point to documents folder in disk C. When I install I don't costumize CMS, but clearly declare rute in disc D for all install. I had a previous install of DS4.5 in C, but I uninstall with recommended procedure: Uninstal CMS, Uninstall DS4.5. Also I erase all DAZ 3D folders in folders "Archivos de Programas"(spanish version for program files), "program files", "Documents" and user/adpdata/roaming after restart PC, after uninstall. I know there is a extra intaller with content, but I supose that genesis is installed with the program, not with extra. If I'm wrong please, you say me. Is there some important advice on configure install in secundary disk?, please. Did you point the content files to the drives in your directories? Genesis Essentials is just the content, with tweaks, that has been in the main DAZ Studio installer previously. The content is expected to be more stable (not to need as many updates) going forward, so it was split out to reduce download sizes next time the application is updated. Yes. I set "Program files" as "D:\Program files\..." and so, and I cut "content files" as "D:\DAZ 3D\Studio4\My Library"
Ok. This say that Genesis isn't in program install, but it is in essentials. Program and essentials must be installed to beging the party. I hadn't notice this. First DS4.5 ofitial install was over DS4.5 candidates. In home machine (Win 7 32 bits) wardrobe and another conten was erased, I used essentials, but in office (Win 7 64 bits) nothing was erased and I didn't need essentials install. For I what I see so far, DAZ Studio 4.5 Pro runs slightly faster than the previous version,and with the same qualities. How about you other users of this latest update? Well I reinstalled all of my DAZ character content. I'll probably have to reinstall the stuff that was freebies or from Rendo as well. I get the missing file alerts on things, but they load anyway, and I get the duplicate file alert when I launch now, but the program seems to just tell me and then go on running. I may need to download some updates at some point, but it doesn't appear to be a critical need right at the moment. The log file claims that Decimator, GoZ and Dynamic Clothing control are disabled. I had reset my download on the Dynamics and the others were fresh downloads after having "purchased" the program. So I don't know what the problem is. I've not yet got a serial number from DAZ, and the program hasn't asked for one. Nor have the plugins. I found this to be content path related. EG if the last content I loaded came from a huge runtime, it takes longer to startup because it must populate the content list before starting up. Now before I quit I make sure my content browser is pointed to Genesis instead of my poser runtime and it starts up fast eveytime. Ah, well I'm not going to remember yet another thing I have to do before shutting down the program. But glad to know there seems to be a solution! Sorry, I'm a little confused about updated genesis installers. If I have installed previous versions of genesis installers, and have now upgraded to 4.5, and there is a newer genesis installer versions...do I need to download these newer versions and reinstall all these products in all these cases? Also, I'm getting a lot of "duplicate IDs found" on products since the upgrade. What is causing this and can it be resolved? ...Richard thanks. So installing this should have no impact on the application's actual performance then. So as to the texture map issues and scene corruption after saving, does this mean I need to re-map all my directories again? No, I am not interested in Lux. And I prefer vendors who are updating their things to vendors who just say they are not interested anymore.